I feel like I have been wearing more black this year alone than I ever had in my lifetime. It is definitely growing on me, although the amount of cat hair it attracts is still annoying. Anyways, after a full week of rain the weather is glorious once again. Yesterday I slipped into this simple leather and lace dress and went around town for apartment viewing. I love how you can dress it down for daytime and dress it up for the night. I paired it with this lovely little embroidered clutch by Darling and my new favorite wedges from Sole Society, don't you just love the black and bone combo with that one black strap down the front? It's so sleek! Hope you all have a wonderful Monday, I am off to an overnight getaway at the vineyards in Carmel. Ciao! Black leather and lace dress c/o 6KS. 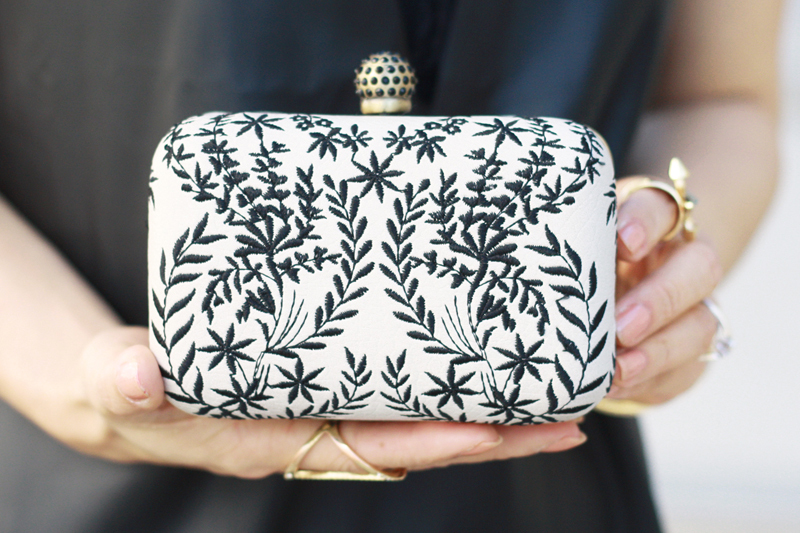 Delilah embroidered clutch c/o Darling. Darcie strappy wedges c/o Sole Society. That dress is so pretty and classy! Also, I'm loving that clutch as well! Stunning photographs, you look flawless as usual! I adore your bag, and those shoes - I love the caged effect, and in white it's perfection! Leather and lace.. has there ever been a more magical combo?